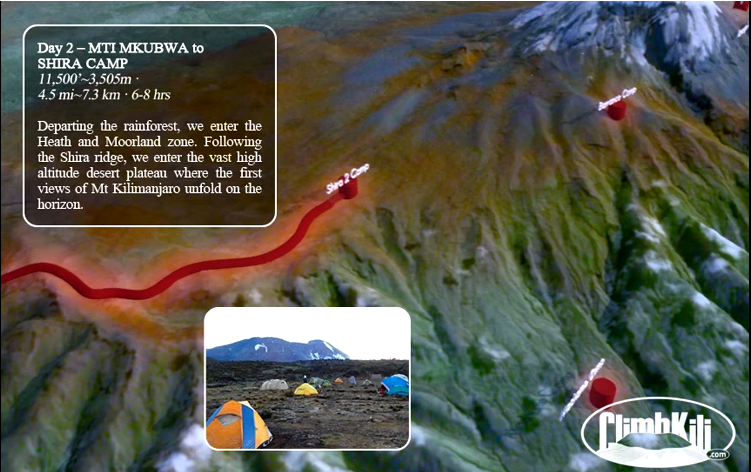 The Kilimanjaro Warriors have completed day two on the Lemosho route. While they avoided precipitation today, yesterday’s rain left heaps of mud. From the rainforest, they hiked for 4.5 miles along the Shira Ridge. After 8 hours, they entered high altitude on a desert plateau, finally to arrive at Shira Camp, 11,500 feet. With thick mud, arduous hills and troublesome rocks, this was a difficult path for them. Despite sliding and falling on the mud, laughter could be heard throughout the rainforest. Erich Ellis took a very hard fall today, but it seems he will be fine after some rest. Sarah Evans is very sore, but pressing along. Orlando Gill also took a hard fall and has some swelling in his leg. He is moving along slowly. He would like to say hello to his friends and family following his journey. Steve Martin, Kisha Mackerny and Nick Perales are doing well. Orlando and “Mack” (unsure if this means Kisha Mackerny or the group’s therapist, Mark), would like to send a shoutout to the Center for the Intrepid. Tonight the group will rest with an astonishing panorama of Mount Kilimanjaro on the horizon. Stay tuned and feel free to leave encouragement for the team below! You guys are amazing! I’m telling everyone at work about what you are doing so you have lots of people cheering for you and eager to hear about your progress. Keep it up!! Glad to hear you all are doing good despite the muddy conditions. Stay strong and carry on!!! So proud of you Steve. Be safe. You guys are awesome, I hope the weather gets better the rest of the way. were standing by for updates, Tell kisha everyone is watching for updates. Houston Texas and the Texas Sentinels Foundation are cheering for our very own Nick Perales. You’re an amazing group. I like your determination. Climb on!! Hang in there, all of you. Kisha we are all rooting for you, hang tough. Hang in there. The longest journey is one step at a time. Proud of all of you! Go Sarah and the Kilimanjaro Warriors! Rest up and press on. Pain is temporary, but pride is forever, and you guys have a lot to be proud of. So proud of all of you. You are truly amazing. I tell everyone I can about you and what you are doing that the rest of us don’t have the courage to try! I love reading the updates about your incredible journey. Hang tough, and persevere: victory awaits! GO SARAH! GO SARAH!!! Go Team! Way to rock it guys! Amazing! Wishing healing for those who fell, courage for those who are discouraged, and superhuman strength for all. Countless people are cheering you on every step of the way. Amazing, with your strength and perseverance you all are such a great example for everyone! You guys are doing so great and very inspirational. Jeremy and I are rooting for you all back here in San Antonio. Keep up the good work and always know that nothing can stop you from anything. Best of Luck! Aloha team! Hawaii is rootin you all on! Best of luck!!!! Awesome X 10. Love your tenacity my lovely warriors. You men and women are very inspirational both to my daughters and to my wife and I. Southlake is pulling for you! Best wishes, stay safe!! Go team Steve!! We are all proud of you!! When the going gets tough, the tough get going and you guys are the toughest! Stay strong. Glad to hear there is much laughter. You all are a great team!